Proposed new anti-terror laws could give police greater powers to stop and question anyone in the UK. The new legislation would be similar to that already used in Northern Ireland. Police are still likely to need a "reasonable suspicion" a crime may be committed. Anyone refusing to co-operate could be fined up to £5,000. At present, under section 44 of the Terrorism Act 2000, officers already have the power to stop and search people or vehicles in an area seen as being at risk from terrorism even if they are not suspected of any breach of the law. A Home Office spokeswoman said that the new proposals would give officers an automatic right to stop and question anyone in the UK about suspected terrorism. Critics including civil liberties campaigners, Muslim groups, opposition parties and Northern Ireland Secretary Peter Hain expressed their concerns about the effectiveness of the proposals. Peter Hain, the Northern Ireland Secretary, warned that Britain must take care that its anti-terror legislation does not alienate whole communities, such as Muslims. The deputy Labour leadership contender told BBC1's Sunday AM programme: "We've got to be very careful that we don't create the domestic equivalent of Guantanamo Bay, which was an international abuse of human rights, acted as a recruiting sergeant for dissidents and alienated Muslims and many other people across the world." He would wait to see the details of the proposals but insisted they should be clear in balancing civil liberties with protecting people's security. William Hague, the shadow foreign secretary, told the same programme that the Conservatives would consider the proposals on merit. "If they are measures that are truly necessary to combat terrorism...then we will support them but these things should be done on a basis of trying to get some consensus across political parties," said Mr Hague. The ex-Tory leader warned that the proposals must be "consistent with popular consent" and not "alienate the people we need in the fight against terrorism". Liberal Democrat home affairs spokesman Nick Clegg accused the government of seeking a "police state" and warned it would only increase radicalism. Ahmed Versi, editor of Muslim News, a newspaper for British Muslims, warned that extending police powers would be "counter-productive" to improving relations with Muslims and could drive some towards extremists. Massoud Shadjareh, chairman of the Islamic Human Rights Commission, said it was essential to separate security issues from the "politics of fear" and warned that ethnic minorities, especially Muslims, were already more likely to be stopped by police. When it emerged on Thursday that three men suspected of wanting to kill UK troops had disappeared, Mr Reid criticised his political opponents and judges for stopping the use of tougher measures against terror suspects. He promised new anti-terror measures and told MPs that the government could consider suspending some parts of the European Convention on Human Rights (ECHR) so it can impose tougher control orders. Should police have more powers? The Home Office would not comment on suggestions the new laws were to be rushed through before Tony Blair steps down as prime minister on 27 June. 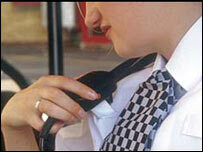 Greater powers to remove vehicles and paperwork for inspection are also believed to be part of the measures. Writing separately in the Sunday Times, Mr Blair said the disappearance of the three suspects under control orders was a symptom of a society which put civil liberties before fighting terror. The prime minister described this as "misguided and wrong" and said prioritising a terror suspect's right to traditional civil liberties was "a dangerous misjudgement". He said: "If a foreign national comes here, and may be at risk in his own country, we should treat him well. But if he then abuses our hospitality and threatens us, I feel he should take his chance back in his own home country." The Sunday Times claims police minister Tony McNulty told Mr Blair the new "stop and question" measures would be "very useful UK wide". It quoted a letter sent to the prime minister which said the measures would be "a less intrusive power" than stop and search, which are widely seen as unpopular with the public. Campaign group Liberty also criticised the proposals and said the police should not have powers to question people "willy-nilly". Director Shami Chakrabarti said: "This looks like political machismo, a legacy moment. "Stopping and questioning anyone you like will backfire because people will be being criminalised."